HCM CITY — The second Ornamental Fish Festival opened at Lê Văn Tám Park in HCM City’s District 1 on November 9, with 120 ponds of fish and 50 booths displaying materials and equipment used for breeding. The festival offers ornamental fish enthusiasts a chance to learn more about different species of fish, promotes their breeding and is a forum for aficionados to exchange experiences. There will also be a conference on developing the market for ornamental fish. HCM City is the country’s ornamental fish breeding hub, with nearly 88ha of breeding ponds and more than 290 breeding establishments. The city targets production of 140-150 million ornamental fish this year, a year-on-year increase of 10-15 per cent. With demand expected to remain strong, businesses and breeders in the city seek to expand linkages in production and boost sales to both the domestic and export markets. The festival is part of the sixth Hi-Tech Agriculture and Food Industry Fair (Hi-Tech Agro 2017) being held at the park from November 9 to 13. 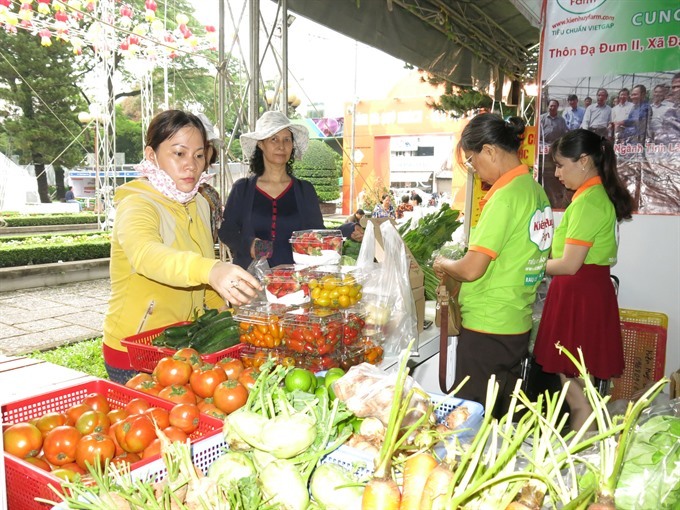 Organised by the Investment and Trade Promotion Centre of HCM City, the Department of Agriculture and Rural Development, the HCM City Agricultural Hi-Tech Park and the HCM City Food and Foodstuff Association, the fair has 300 booths set up by 220 companies from HCM City and elsewhere. Besides showcasing hi-tech agricultural products, fresh and processed foods and foodstuffs, the event also has 80 booths exhibiting food processing equipment and technologies.